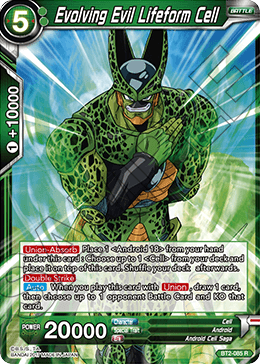 Place 1 ＜Android 18＞ from your hand under this card : Choose up to 1 ＜Cell＞ from your deck and place it on top of this card. Shuffle your deck afterwards. When you play this card with , draw 1 card, then choose up to 1 opponent Battle Card and KO that card.